Articulated action figure from the original Alien movie. Highly detailed SH MonsterArts version measures 7-inches tall. Features translucent head parts, interchangeable hands, and a special display stand! 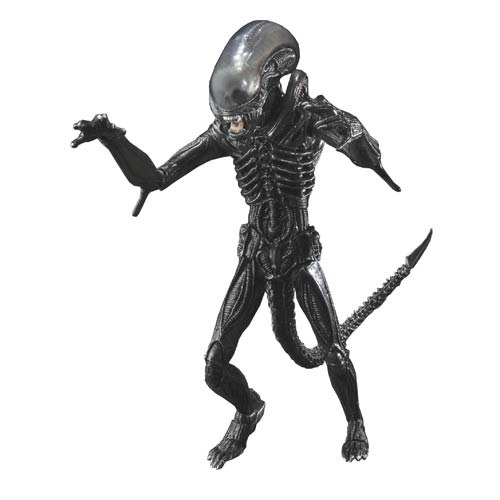 Big Chap from the original Alien film returns as this detailed 7-inch Alien Big Chap SH MonsterArts Action Figure from Bandai Tamashii Nations. Articulated (including the tail! ), it boasts translucent head parts, interchangeable hands, and a special display stand. This classic creature's distinctive translucent head carapace is rendered with a separately-molded semi-translucent part, allowing the precision-sculpted skull beneath to show through. The bone-like tail is built from 18 individually jointed segments for enhanced detail, and the tip employs die-cast metal for enhanced weight and realism. Imported from Japan. Ages 15 and up. Big Chap from Alien comes to the highly detailed line of SH MonsterArts action figures! Developed from the ground up to replicate poses from the original Ridley Scott Alien film, the overall style dictated by the long arms and legs of the actor inside the suit, along with the fine sculpting of the suit itself as designed by H.R. Giger, are exquisitely replicated in the product.